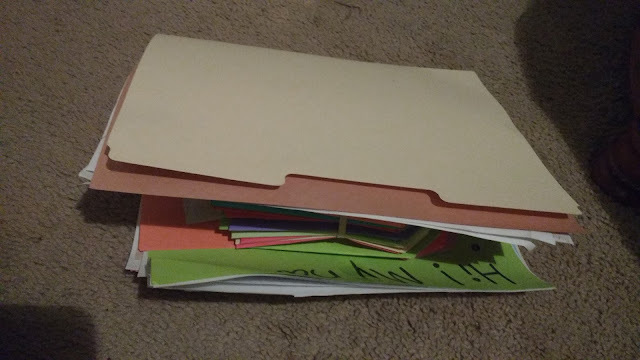 Since I started teaching, I have kept all of the notes and pictures from students. When I'm having a bad day, I can look through these and remember why it is I do this crazy job on a daily basis. Until recently, these have lived in an over-flowing file folder. When I was in Oklahoma City for the Teacher of the Year Ceremony, I picked up a decorative box at Tuesday Morning. 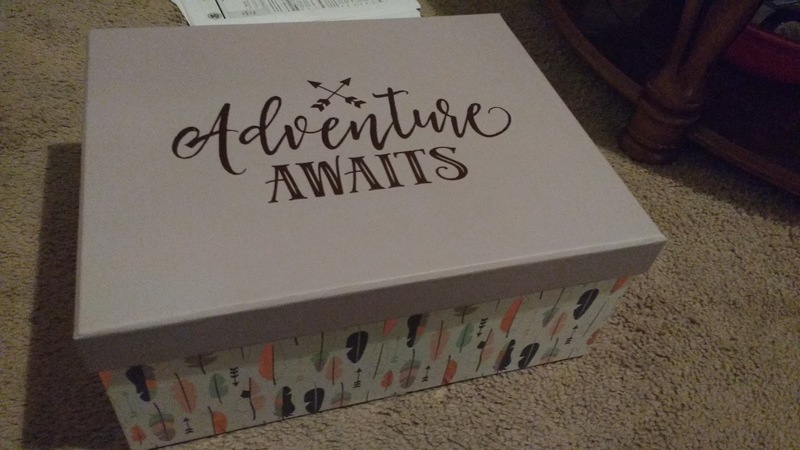 I had two requirements when looking for a box: the box had to have a cute design, and the box had to hold letter-sized paper. Now my teaching mementos are easier to look through and cute when sitting on the shelf! Quick post today to share a foldable I made to review the distributive property with my Algebra 1 students. This is one of those topics that my students have seen since they were in the seventh grade, but they still make mistakes. I wrote these notes with these two mistakes in mind. On the inside, I gave students a table to fill out that walks them step-by-step through the distribution process. My favorite column is the second one: What should be distributed? 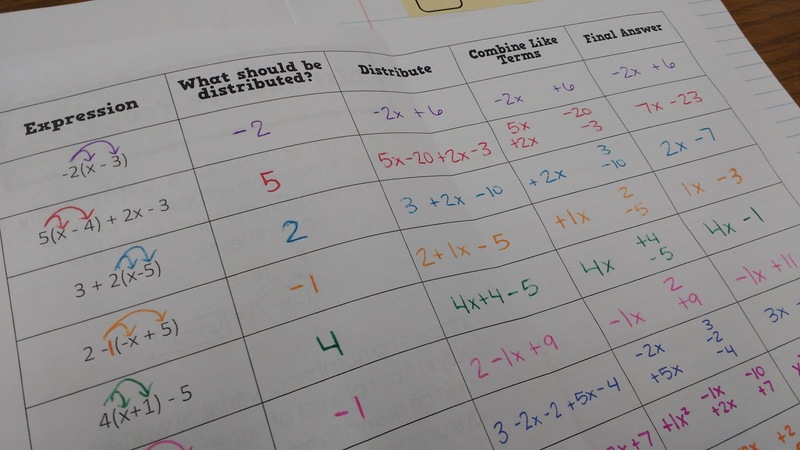 Before beginning the multiplication process, I want my students to think critically about what number is actually being distributed. I place a big emphasis on drawing in our invisible 1's! For combining like terms, I teach my students to place the like terms in groups. 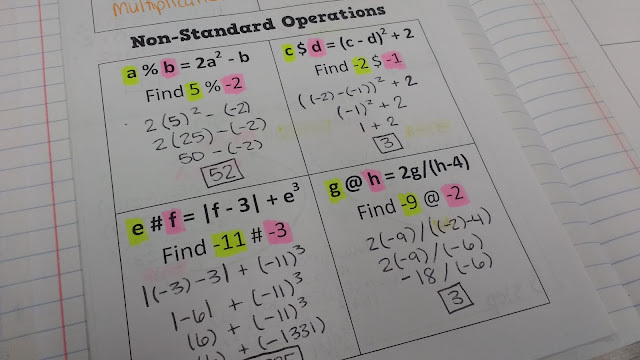 Eventually, they wean themselves off this method, but I find it helps my students way more than the more traditional way of color-coding or shape-coding the like terms. 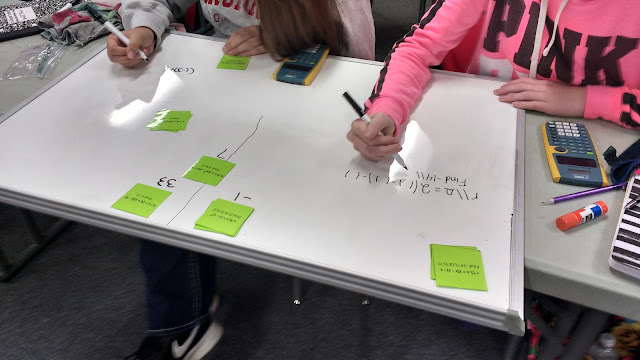 After filling out the table, we tackled a few more advanced distributive property practice problems. You can see our grouping strategy more easily here since there are more terms to combine! You can download the files for these notes here. 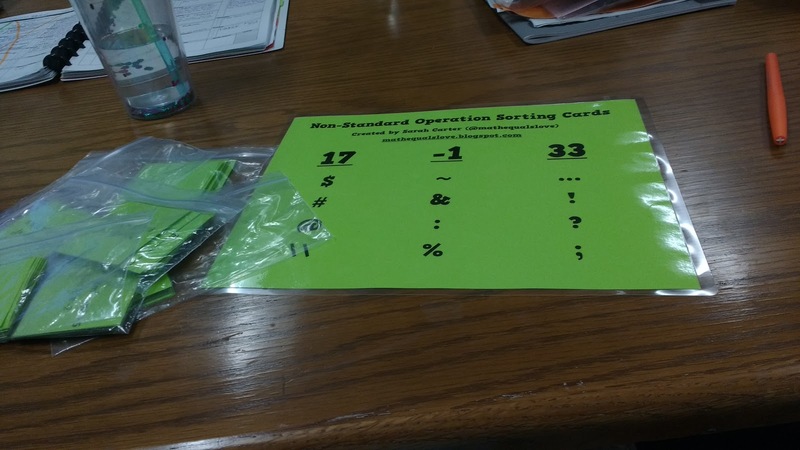 Since I've already blogged about my INB notes for Non-Standard Operations and my Add Em Up Activity for the same topic, I decided it was finally time to blog about one of my favorite activities that I've created this school year: Non-Standard Operation Sorting Cards! 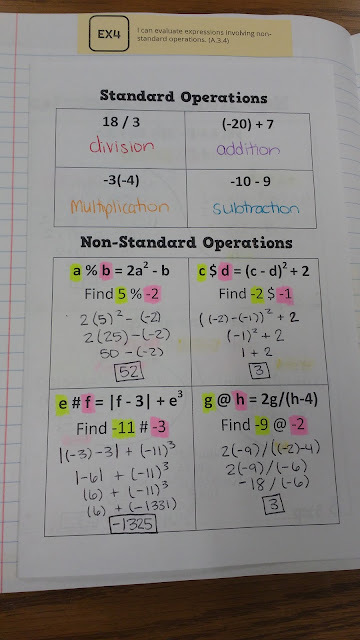 I've done quite a few Question Stacks lately, so I decided I wanted to change things up a bit when it came time to do some practice for Non-Standard Operations. It's gotten so that my students think we're doing a question stack EVERY SINGLE TIME I pass out a bag of cards! And, yes, I realize I'm behind on blogging all my new question stack files. It's on my to do list. I promise! 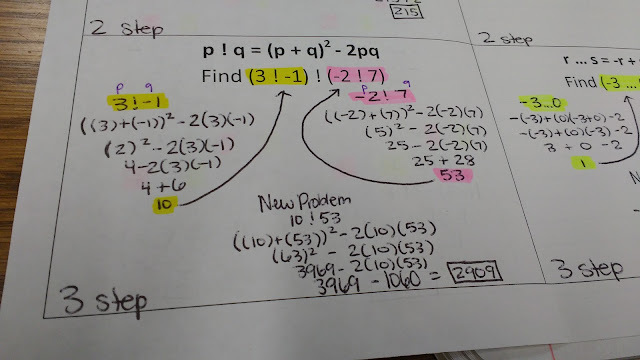 To make this activity, I created twelve problems. 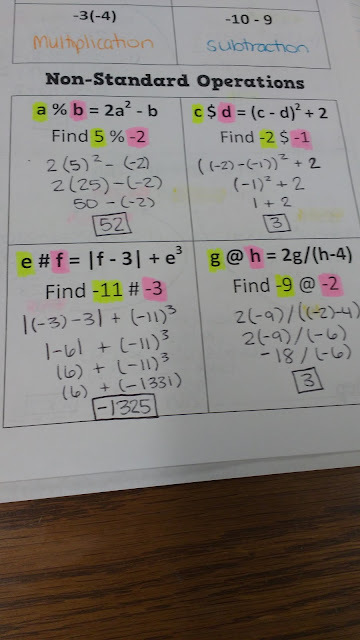 I intentionally wrote the problems so that there were three different answers with four problems resulting in each answer. Special thanks to my husband for helping me craft some of these problems to come out to a specific answer! When I would write a problem that failed to come out to the right answer, he would help me tweak my numbers so it worked. This was a trickier task to do than I initially thought when I set out to make these cards! The idea behind this activity is that students get a deck of cards. They are told that there are three different answers. Groups of students work through the decks of cards to determine the three answers and place the cards in three piles according to their answers. To help my students out, I did give them a hint that there were four cards for each answer. I also typed up an answer key that I could use to easily check a group's work. I laminated my answer key on the same color of paper as the cards. After explaining the activity, my students took off. 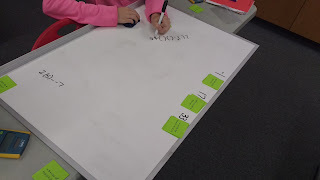 We used our jumbo group-sized dry erase boards for this activity. They were the perfect size for multiple students to work around! I loved the self-checking aspect of this activity. 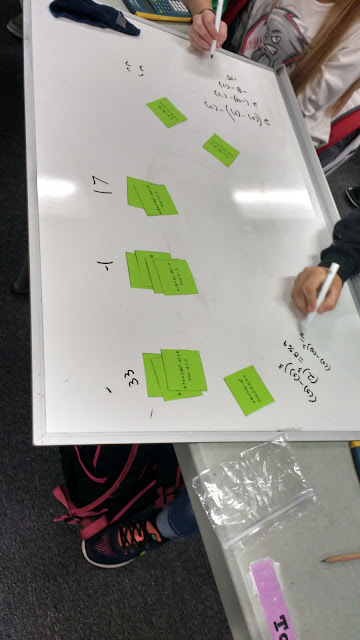 Many groups found themselves in the scenario where they had found four different answers. Often one of these answers would only have one card in its pile. 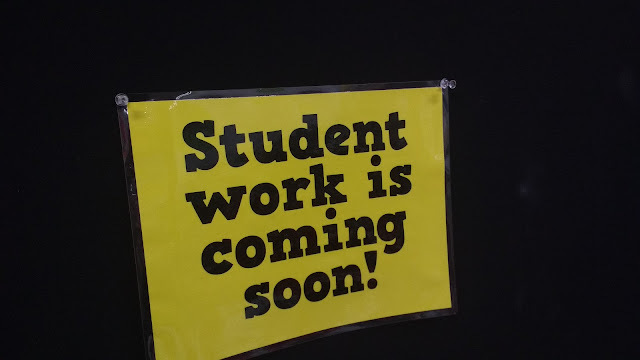 Students knew that this was the problem they needed to rework. I loved walking around the room to see how different groups were organizing their work. 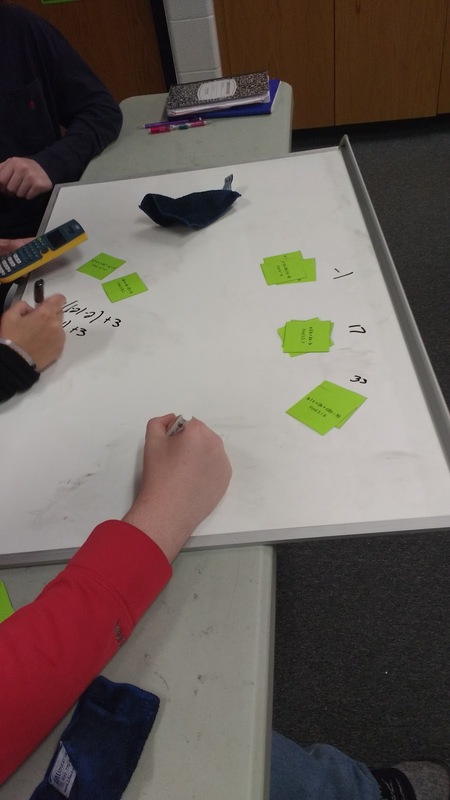 Some groups dealt the cards out to group members before beginning so that each group member worked the same number of problems. 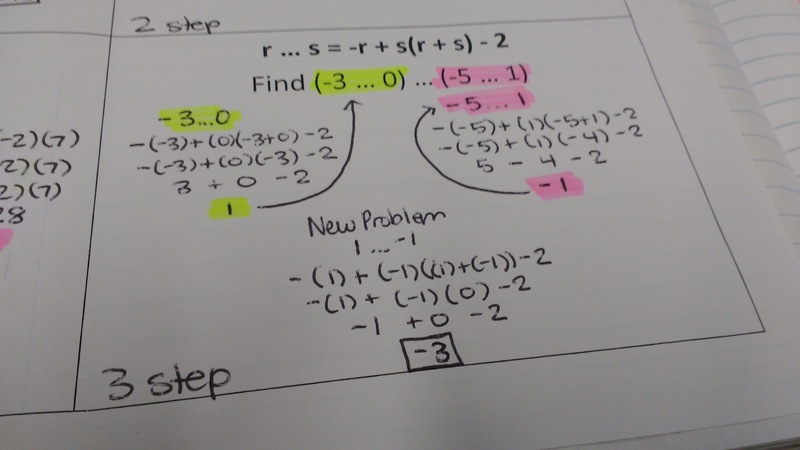 This worked well until one group realized that one group member had gotten ALL one-step problems! I look forward to applying this practice structure more in the future! 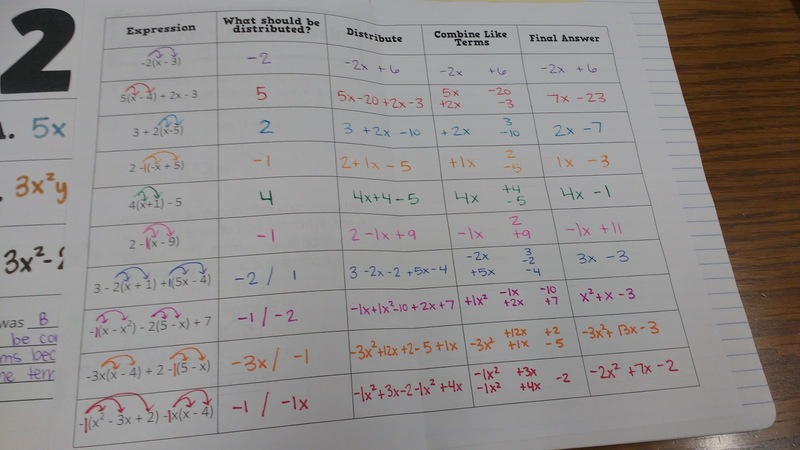 There is something powerful about giving students a limited number of answer choices. 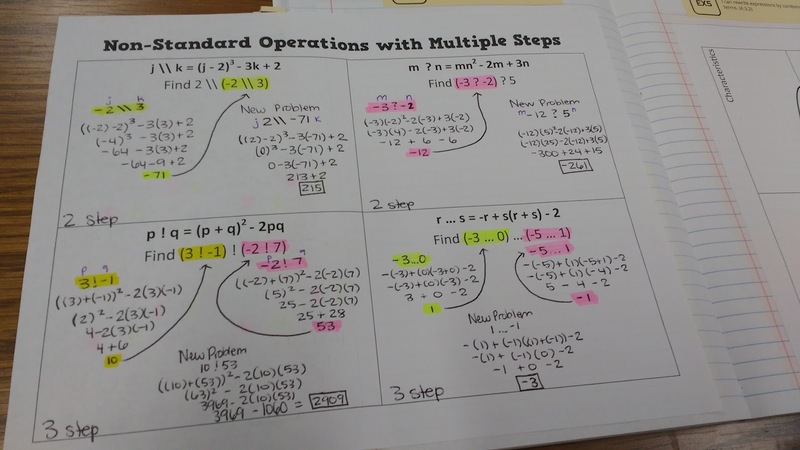 I saw student confidence with non-standard operations grow with leaps and bounds as my students worked through this activity. I gave my students thirty minutes for this activity. For some groups, this wasn't enough. For other groups, they finished after fifteen to twenty minutes. 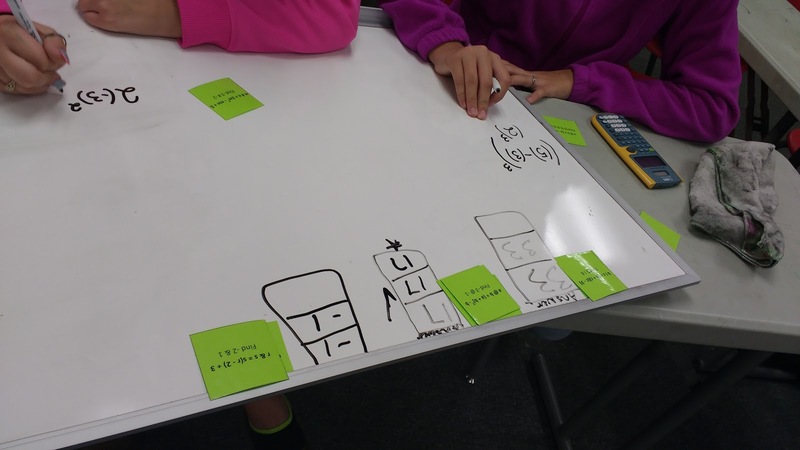 Luckily, I was able to have my groups that finished early work on the Add Em Up activity. This activity is a definite keeper! You can download the files for this activity here. Last year was the first year that non-standard operations made an appearance in Oklahoma's math standards. That was also the year that I mistakenly thought that I would just throw non-standard operations into the same skill as evaluating expressions. After all, they are pretty much the same thing, right? Though I may have thought so and still think so, my kiddos did not agree. 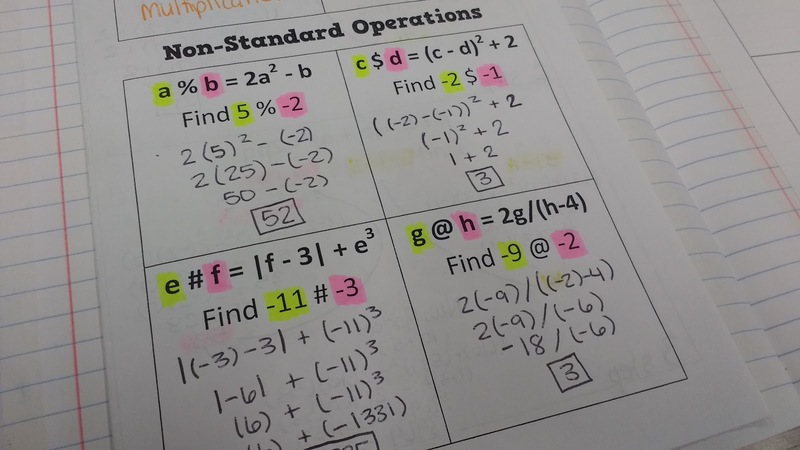 This year, having learned from last year's experience, I made non-standard operations their own separate skill that immediately followed the skill of evaluating expressions. I decided that before we could discuss non-standard operations and all their weirdness, we needed to refresh our memory of what the standard operations were first. My students eagerly filled in the meaning of each of the symbols. Then, we moved along our merry way to non-standard operations. Class, what does it mean when we have a percent sign in our problem? My students were full of ideas. Some thought it meant we should divide by 100 or move the decimal. Others insisted that it had no place whatsoever in a math problem. Therefore, we shouldn't do the problem. Sorry guys. No such luck. I started to ask some leading questions. What variable is in front of the percent sign? A. Good. What number is in front of the percent sign? 5. Great. So, what number do you think we should plug in for a? 5. Awesome! This is when I let them in on the trick. 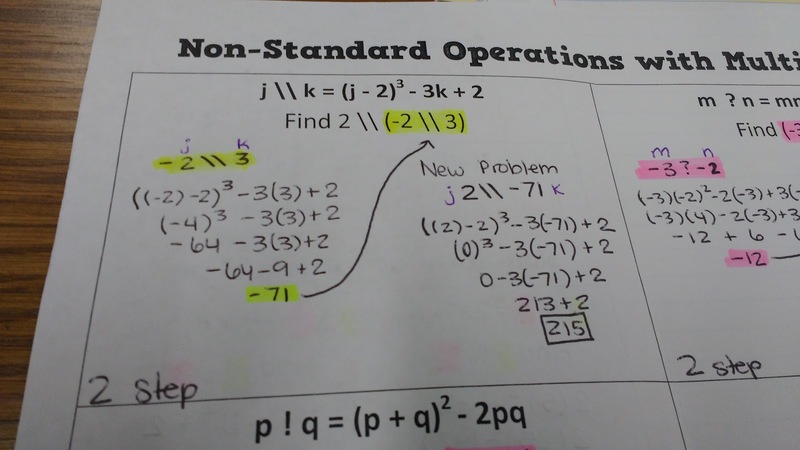 Non-Standard Operations problems are really the same type of problem we have been doing (evaluating expressions.) They are just written using a secret code. I proceeded to tell them about the days before non-standard operations were in the Oklahoma standards. My students would come back from taking the ACT over the weekend. When I asked them how the test went, they would quickly tell me that there was a weird symbol on the test that I had never taught them! 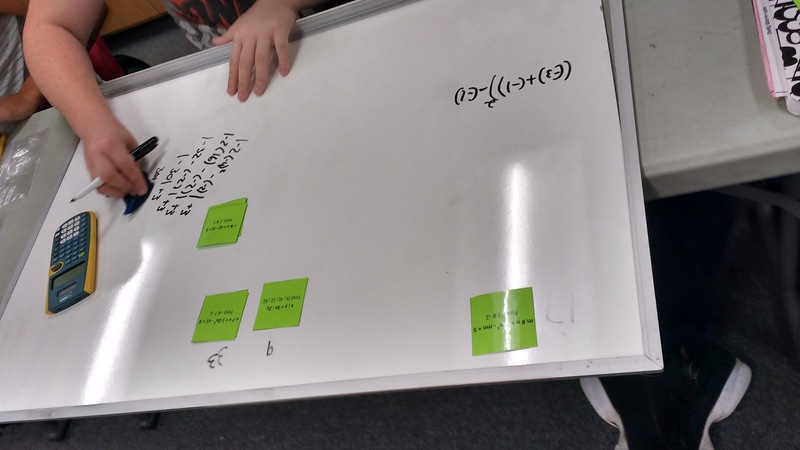 Whenever I would write a made-up question on the board and work it out for them, my students would be so frustrated that they had missed a question that was easy but had only looked complicated. Here's an example from an old Preparing for the ACT PDF (59F). Though my students were wary to tackle these problems, we proceeded. After cracking the code for the first few problems and figuring out that the weird symbol is just there as a clue for which number to plug in for which variable, my students were soon on a roll. Then, we hit the inside of the foldable. There was confusion. There was panic. Things were NOT good. You see, suddenly there were more numbers than variables. Whatever should we do? 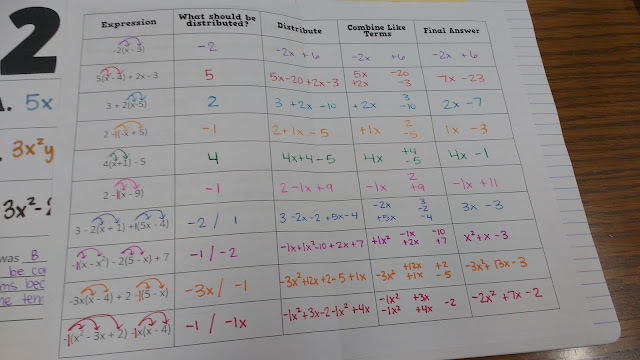 When I grew tired of the looks of confusion coming from my students, I asked them what we would do first if this was an order of operations problem. Parentheses! Okay then, let's do the parentheses. But, what about the 2? Is the 2 in the parentheses? No. Then, let's not worry about the 2. Let's do what's in the parentheses first. But, there's a 2 in front. What do we do with the 2? Just trust me. Let's do the parentheses. Then, we'll talk about what to do with the 2. They weren't happy about it, but they were eventually persuaded to move on and try the parentheses. After solving the problem in parentheses, we replaced the parentheses with the value we had just arrived at to find our new problem to solve. Some students were confused about whether -71 would be our j or k in the above problem. I had to remind them to look at where the parentheses were in relation to j/k to figure out what -71 would be. This was something I had to remind my kids of throughout this skill. After slogging through that first problem, we started to pick up some speed. Then, panic ensued once again. Until, of course, someone suggested that this was just a three step problem. 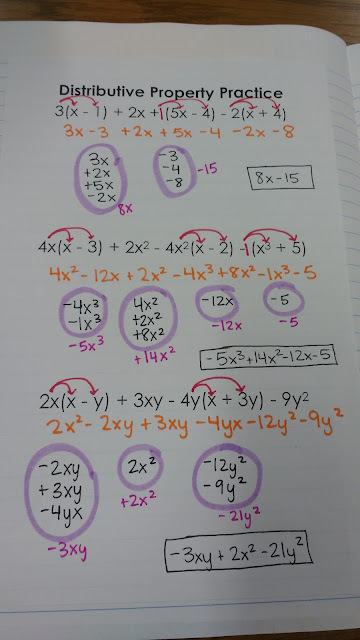 We'd do each set of parentheses then take our values and do the problem one last time. There were groans and complaints, but we moved forward. 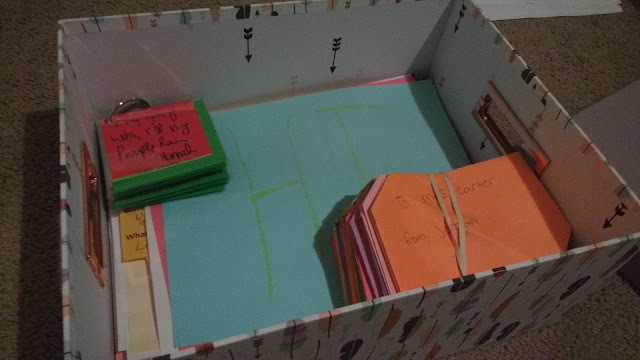 The biggest complaint was that there wasn't enough space in the box to write all three steps. 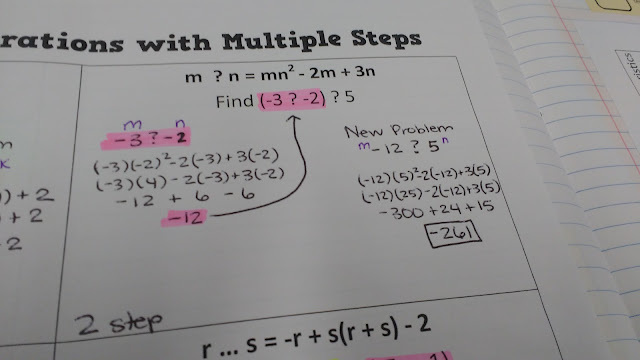 I was super proud of my students when they asked if they could do the last problem all by themselves! Overall, I'm much happier with how our notes for non-standard operations turned out this year. Next year, I do want to edit a few of the questions. 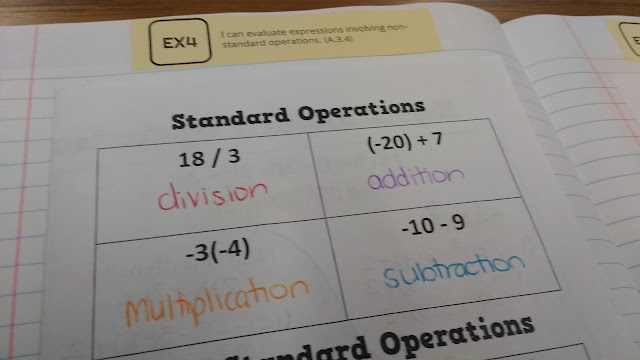 I gave them a quiz question that had a plus sign between two sets of parentheses instead of the non-standard operation, and every single kid treated it as the non-standard operation instead of adding their two answers. So, I'd like to change things up a bit next year so kids don't get into such a routine that they do things without thinking! After completing the notes, my students were still pretty shaky and needed lots of practice. We achieved that through an Add Em Up activity that I blogged about here and a sorting activity that I will blog about soon! Usually, I'm a big fan of decorating my bulletin boards. Hello, I have an entire page on my blog dedicated to bulletin board designs. This year, after moving classrooms for the second time in two years, I decided to take a different approach to bulletin boards. I still decorated the walls around my bulletin boards, but I chose to keep the bulletin boards clean and reserved for student work. My thought behind this was that I have lots of energy to decorate before school starts. After school starts, that energy is devoted elsewhere. So, if I want to make a habit of displaying student work in my classroom, I need to make it as easy as possible. Otherwise, it won't happen! In this photo, you can see my two bulletin boards. I had several others in my first classroom, but my new classroom didn't have enough wall space. My husband ended up using them in his classroom. To keep my bulletin boards from looking bare and un-decorated, I made a poster to hang on each bulletin board. Want a copy of the poster for your own bulletin board? You can download it here. 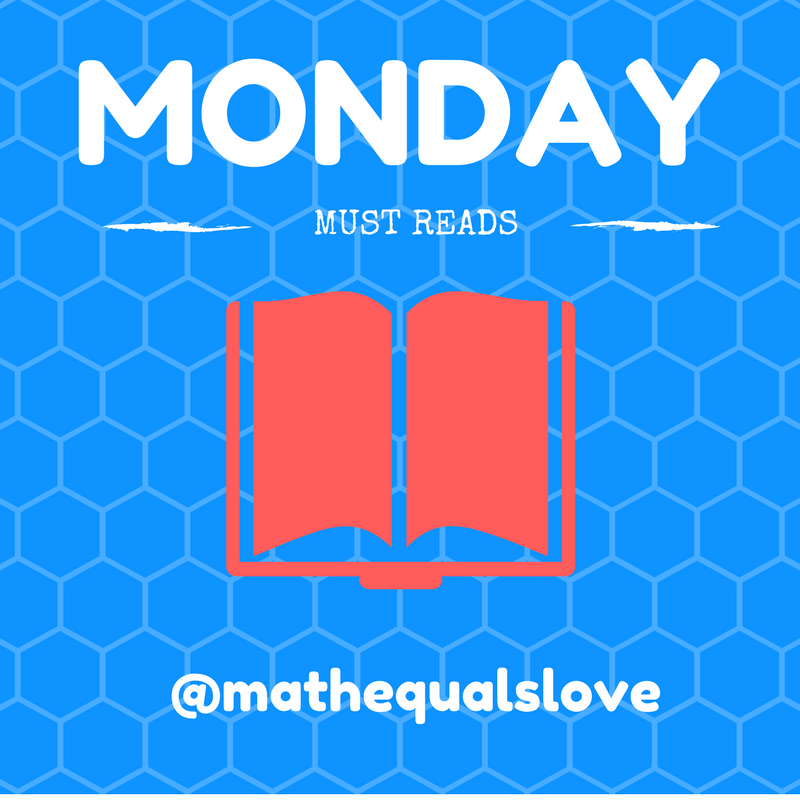 It's time for another Monday Must Reads! Thankfully, it's a much less hectic Monday than last week due to the fact that the Oklahoma Teacher of the Year Ceremony has come and gone. In case you missed it on Twitter, I didn't win. And, I'm completely okay with that. The winner is a fantastic and inspiring lady, and I'm certain she is perfect for the job of OK ToY! I'm 100% at home in the classroom (the same cannot be said for giving speeches on a stage! ), and I'm super excited that I will get to continue teaching in the classroom next year. Otherwise, how would I come up with ideas to blog about?!? Mrs. Riley shares a graphic with different division-related vocabulary. For the past few years, I've taught my students about the word "vinculum." But, "obelus" and "virgule" are new to me! Ms. Lindley has one of the coolest word walls I have ever seen. How awesome is this density display?!? If you're a science teacher, it's worth checking out her twitter feed to see other science word walls! Sarah DiMaria shows students the usefulness of polynomials by having them plan a trip for an unknown number of people! 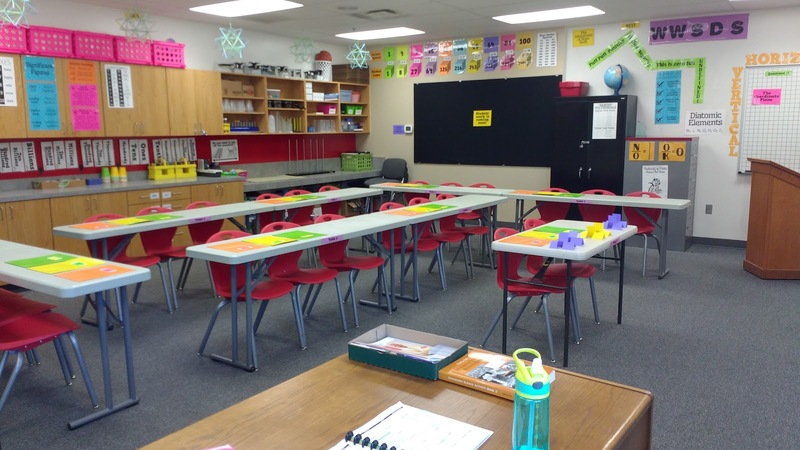 Anna Vance used whiteboard paint on her cabinets to make more space for her students to work around the classroom. Awesome idea! 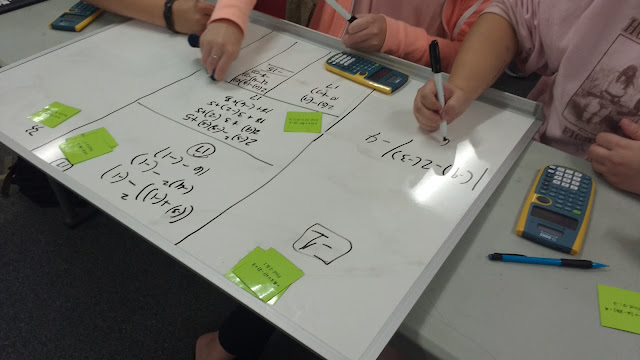 Michelle Russell engages her students in solving for z-scores by challenging them to complete a small puzzle. This makes me wish I was teaching stats this year! 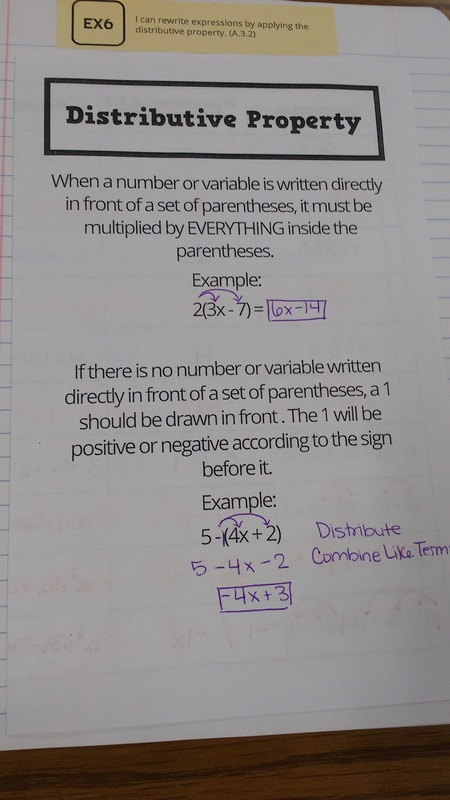 I'm a big fan of using dry erase pockets (affiliate link) in the math classroom! 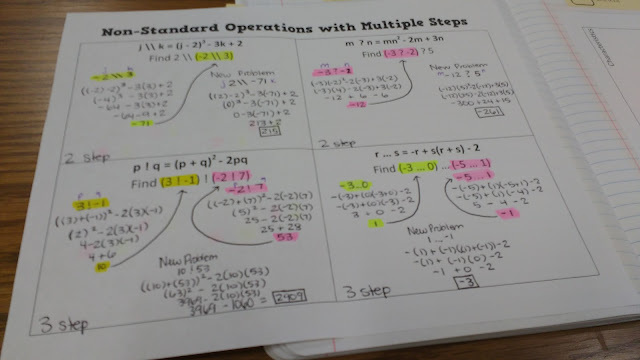 So, I'm super excited to see this solving equations chart shared by Lori B. Knox. 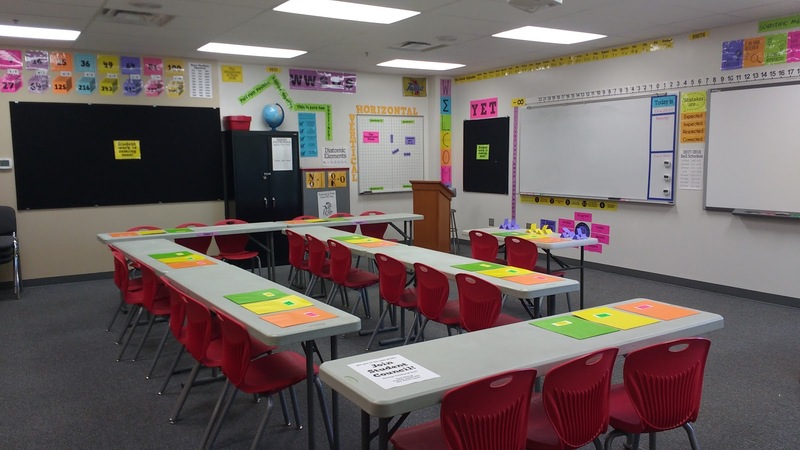 Shaun Carter combined painters tape, laminated letter cards, and magnets to create an engaging-hands-on geometry lesson about angles and transversals. Madelyne Bettis empowers students to take control of their own learning in the classroom by providing a self-check system. 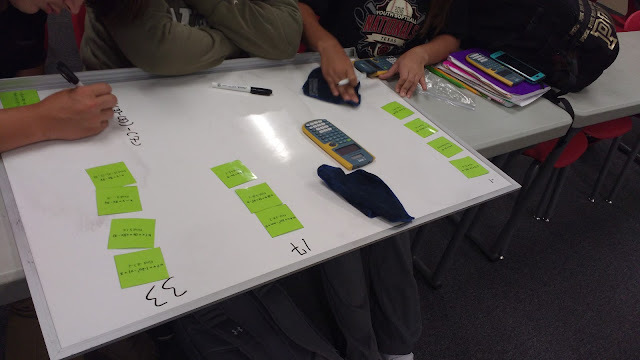 For the second year in a row, I have had my math concepts students make mobiles using construction paper and stickers. When I shared a picture of this year's mobiles, Andrew Gael shared his own project he does with students that definitely knocked my socks off. Andrew has his students make different shapes, fill the different shapes with different numbers of beans, and create an actual mobile! I. Am. Impressed. Mr. Fredericks put a twist on the classic line-up structure. Students had to put themselves in order according to their guesses without talking! 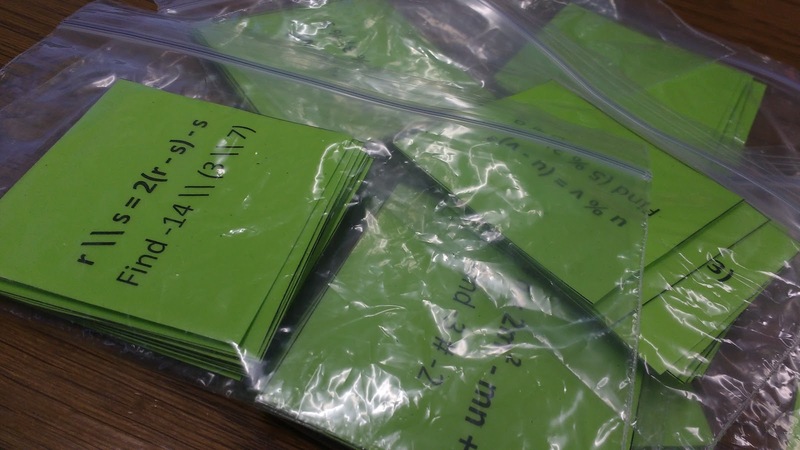 David Butler comes up with the coolest activities for his weekly 100 Factorial events! I've seen the four color theorem plenty of times before. But, I've never seen it turned into a competitive game! David also created a very interesting problem called "Zero Zeros" that I need to spend some time thinking about! Need to teach piecewise functions? 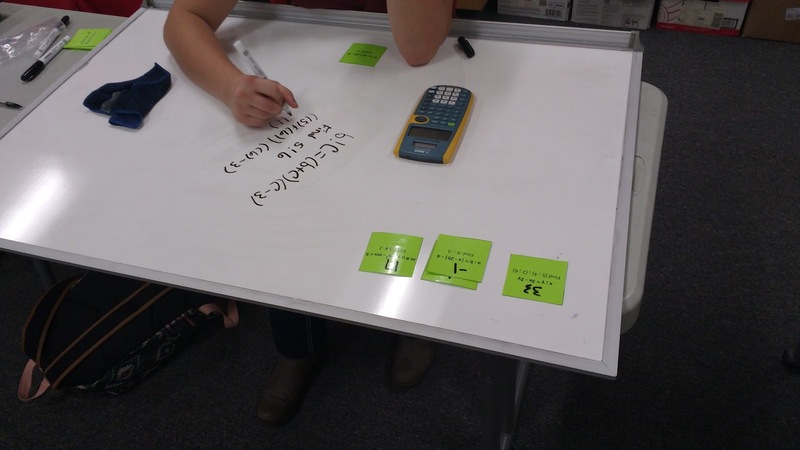 Susan Russo has you covered with an awesome real-life scenario to motivate your graphing. Krispy Kreme Doughnuts! Kathryn Kubena has a way of appealing to your sweet tooth and making you wish you taught geometry all at the same time. The idea of using marshmallows as points and candy corn as arrows is BRILLIANT. Rick Barlow gets his students up and moving around the classroom while practicing their vocabulary. I love everything there is to love about his vocabulary party idea! Can't wait to try this in my own classroom! Check out his blog post here with more details! Need to teach the difference between discrete and continuous? Meredith Purser had the great idea to bring some props to class! 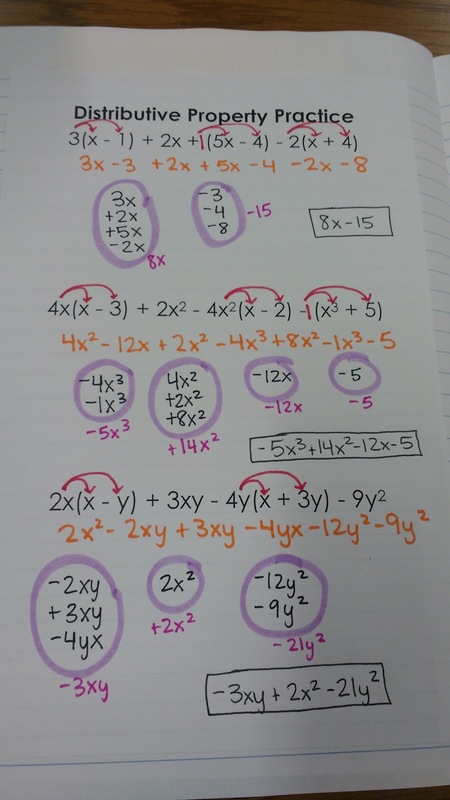 Years ago, I blogged about using fast food combo meals to teach the distributive property. Stephanie Goldberg took it up a FEW notches by having her students build their own combo meals with the most adorable stickers I have ever seen. Joe Cossette shares posters of three actionable norms he plans on implementing in his classroom this year. I think we should all aspire to follow these in our own classrooms. 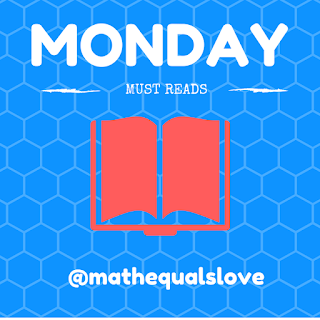 Until next week's post, keep sharing your classroom awesomeness!